If I may quote Oscar Wilde, he once said that “….life imitates art….” I was given a wonderful example of this when a Hidden Mickey Fan Club member sent me a few pictures of youngsters enjoying the Hidden Mickey Adventures in Disneyland game book. “Where are the numbers? I don’t see any numbers!” The boy jumped back and forth at the black iron gate surrounding the popular ride, eagerly staring at the smiling gray elephants whizzing by overhead as they were being encouraged by Timothy the Mouse. 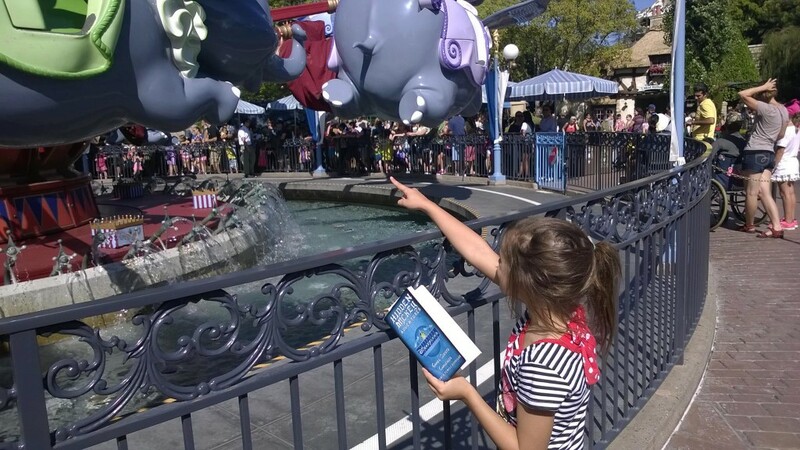 You can see in the picture that young Rhiley, age 6, is holding the Hidden Mickey Adventures in Disneyland game book and doing Quest #2 – The Junior Road Rally, and she is on the same question that Andrew, age 7, was doing in the story! It is always heart-warming for an author to see families enjoying their works. My idea behind developing the game books was just that – families having fun together and doing something different at the Park. So, whether you are 6 or 60, a first-time visitor to the Disney Parks or someone who has gone so many times that it is impossible to count, there is something just for you in the Hidden Mickey Adventures game books. If you are going to Disneyland, Disney California Adventure, or Walt Disney World’s Magic Kingdom, there is a book for you! If you would like to follow the further adventures of Andrew’s oldest brother, Peter, and his family, be sure to check out my Hidden Mickey Adventures series of novels. Explore hidden parts of Disneyland and see the Park with a new set of eyes, and learn more about the exciting history of the man who started it all, Walt Disney. All the Hidden Mickey and Hidden Mickey Adventures novels and game books can be found at Amazon.com, Barnes&Noble, and my own web site at HiddenMickeyBook.com. Hidden Mickey books, Cover Art, and Jewelry! Hidden Mickey Adventures Game Books – On Sale!